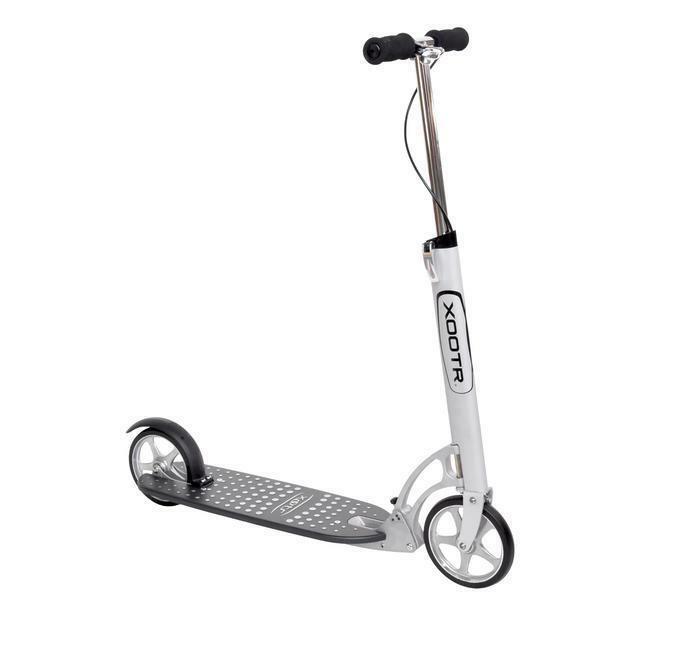 Xootr of Old Forge, Pa., is recalling about 3,000 Xootr adult kick scooters. The steer support can break during normal use, posing a fall hazard to the user. The firm has received six reports of breaks in steer supports, resulting in one report of scrapes and bruises from a fall. This recall involves all Xootr adult kick scooters with the QuickClick push-button latching mechanism. The silver scooters are 30 inches long by 10 inches wide, and have a handlebar height of 36 inches. The Xootr logo is on the deck and lower section of the handlebar. The scooters have a plastic, wood or metal deck, and can be identified by a black push button located on the steer support. The scooters, manufactured in the U.S., were sold at Lajolla Swim and Sport, Nyce Wheels, San Francyclo and other sporting goods stores nationwide and online at Amazon.com and Xootr.com from November 2016, through January 2017, for about $270. Consumers should immediately stop using the recalled scooters and contact the firm to receive the free repair. Consumers may contact Xootr at 800-816-2724 from 9 a.m. to 5 p.m. (ET) Monday through Friday, by email at support@xootr.com or online at www.xootr.com. You can lead a horse to water, but you can't make it drink -- or so the old saying goes. That wisdom might also apply to school children required under law to be served healthier lunches. You may recall that Congress passed a law mandating more fruit and vegetables in school lunches, in an effort to stem the alarming rise in child obesity. It banned past high-calorie favorites and replaced them with green beans and kale. Any parent who has tried to persuade a child to eat their vegetables could have predicted the result. In this case, University of Vermont researchers produced a study that confirms the suspicions of school officials – many students are putting the fruits and vegetables they're now required to take straight into the trash, consuming fewer than they did before the law took effect. The study reached that conclusion by using digital imaging to capture students' lunch trays before and after they exited the lunch line. The researchers says it is also one of the first studies to compare fruit and vegetable consumption before and after the Healthy, Hunger-Free Kids Act of 2010 was passed. It concludes fruit and vegetable consumption at school has declined since the mandate was put in place in 2012, while waste of these food items has increased 56%. "The basic question we wanted to explore was: does requiring a child to select a fruit or vegetable actually correspond with consumption," said Sarah Amin, Ph.D., a researcher in Nutrition and Food Sciences at the University of Vermont and lead author on the study. "The answer was clearly no. 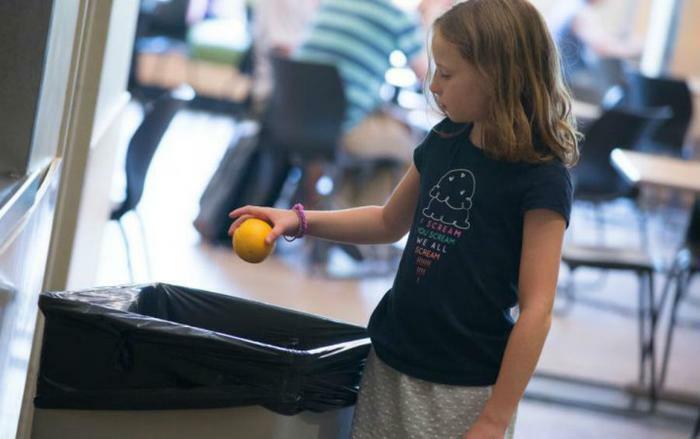 It was heartbreaking to see so many students toss fruits like apples into the trash right after exiting the lunch line." The research team installed cameras over lunch lines at two elementary schools in the northeast and photographed lunch trays before the law went into effect. The researchers returned on multiple occasions after lunch lines began serving up the mandated fruits and vegetables. Amin and her colleagues also looked at what kinds of fruits and vegetables children selected before the stricter mandates went into effect. They found that kids liked processed fruits and vegetables such as the tomato paste on pizza or 100% fruit juice instead of an orange or apple. Amin says policymakers shouldn't give up on the mandates, believing they will eventually take hold, especially if schools make some adjustments in how they implement them. "An important message is that guidelines need to be supplemented with other strategies to enrich fruit and vegetable consumption,” she said. “We can't give up hope yet." Students heading back to school will be getting twice the amount of vegetables and fruits on their meal trays, as well as more whole grains, and less salt and unhealthy fats. The updated school meal standards, unveiled by the U.S. Department of Agriculture (USDA) in January, have been highly praised by health and education groups, including the nonprofit Center for Science in the Public Interest. The standards set calorie maximums for the first time and lower calorie minimums to better ensure that school meals address obesity, as well as hunger. "The new school meal standards are one of the most important measures to promote children’s health in decades," said Center for Science in the Public Interest director of nutrition policy Margo G. Wootan. "With one out of every three children in America overweight or obese, 31 million children eating school lunch, and 15 years since the last update, it was time for a change. School food service professionals are working hard to implement the new standards, and they need the support of parents, teachers, administrators, and food manufacturers." Parents can help by reinforcing healthy eating at home, and encouraging their kids to try the new menu options, says CSPI. Teachers can try the new school lunches and speak supportively about them with students. School administrators can support the program by showing leadership and support for the programs and help ensure the new standards are fully implemented. State child nutrition programs can continue to support school efforts and provide ideas for menus and recipes. And companies can produce products with more whole grains and less salt. The updates to school meals were required by Congress in the bipartisan Healthy, Hunger-Free Kids Act, which President Barack Obama signed into law in late 2010. The law also provides additional funding for school meals through several provisions, including the first increase in reimbursement rates (above inflation) in years and reasonable pricing requirements for school lunches and a la carte items. Beginning October 1, schools will be eligible to receive an additional six cents for each healthy lunch they serve. America's students will be offered healthier food options during the school day, thanks to the Agriculture Department's (USDA) new " Smart Snacks in School" nutrition standards. "Nothing is more important than the health and well-being of our children," said Agriculture Secretary Tom Vilsack. "Parents and schools work hard to give our youngsters the opportunity to grow up healthy and strong, and providing healthy options throughout school cafeterias, vending machines and snack bars will support their great efforts." The Healthy, Hunger-Free Kids Act of 2010 requires USDA to establish nutrition standards for all foods sold in schools -- beyond the federally-supported meals programs. The the new nutrition standards, reflect USDA's consideration and response to the nearly 250,000 comments received on the proposal earlier this year. "Smart Snacks in School" balances science-based nutrition guidelines with practical and flexible solutions to promote healthier eating on campus, drawing on recommendations from the Institute of Medicine and existing voluntary standards already implemented by thousands of schools around the country, as well as healthy food and beverage offerings already available in the marketplace. More of the foods that should be encouraged. Like the new school meals, the standards require healthier foods, more whole grains, low fat dairy, fruits, vegetables and leaner protein. Less of the foods that should be avoided. Food items are lower in fat, sugar, and sodium and provide more of the nutrients kids need. Targeted standards. Allowing variation by age group for factors such as portion size and caffeine content. Flexibility for traditions. Preserving the ability for parents to send their kids to school with homemade lunches or treats for activities such as birthday parties, holidays, and other celebrations; and allowing schools to continue traditions like fundraisers and bake sales. Ample time for implementation. Schools and food and beverage companies will have an entire school year to make the necessary changes, and USDA will offer training and technical assistance every step of the way. Reasonable limitations on applying the standards. Ensuring that standards affect only foods that are sold on school campus during the school day. Foods sold at after-school sporting events or other activities will not be subject to these requirements. Obesity trends in children have been on the rise in recent years. Some states have very loose laws when it comes to what they serve their children in school lunchrooms, but others are adopting more rigid standards to try and provide healthy options for students. Massachusetts is an example of the latter, and after a year of implementation many schools are getting on board. The U.S. Department of Agriculture (USDA) has published a proposed rule to update the nutrition standards for meals served through the National School Lunch and School Breakfast programs as part of the Healthy, Hunger-Free Kids Act of 2010. The new proposed meal requirements will raise standards for the first time in fifteen years and will make "critical changes" to school meals and help improve the health and nutrition of nearly 32 million kids that participate in school meal programs every school day. "The United States is facing an obesity epidemic and the crisis of poor diets threatens the future of our children and our nation," said Agriculture Secretary Tom Vilsack. "With many children consuming as many as half their daily calories at school, strengthening nutritional standards is an important step in the Obama administration's effort to combat childhood obesity and improve the health and well-being of all our kids." 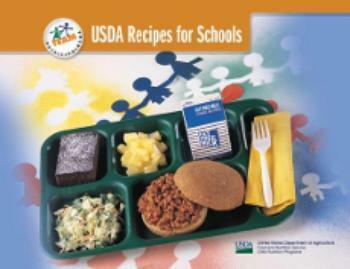 The proposed changes to school meal standards, which would add more fruits, vegetables, whole grains, fat-free and low-fat milk to school meals, are based on recommendations released in October 2009 by the National Academies' Institute of Medicine (IOM) and presented in the report, School Meals: Building Blocks for Healthy Children. Schools would also be required to limit the levels of saturated fat, sodium, calories, and trans fats in meals. 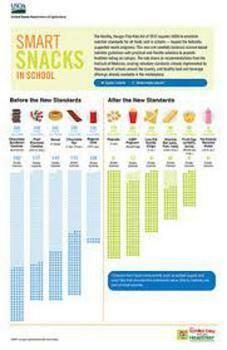 A comparison of the proposed nutrition standards can be viewed here. The Healthy, Hunger-Free Kids Act gives schools and communities new tools to meet the challenge of providing more nutritious food including increasing school lunch reimbursements by six cents per meal, and increasing technical assistance. Margo G. Wootan, director of nutrition policy at the Center for Science in the Public Interest (CSPI) says the new standards "represent an enormous improvement over the status quo." In a statement on the CSPI Website, Wootan says "capping calories, limiting french fries, and reducing salt will all help America’s school children avoid unnecessary weight gain and diet-related diseases." And, she says, "Requiring school lunches to provide more whole grains, fruits, and vegetables will teach kids healthy eating habits that may last a lifetime." School meal programs are a partnership between USDA, State agencies and local schools, and USDA says it will work with schools and communities to help improve meals so that they are consistent with the Dietary Guidelines for Americans. 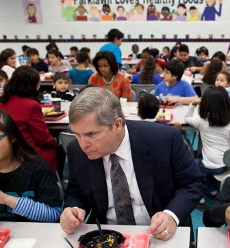 "Raising a healthier generation of kids will require hard work and commitment of a host of partners," said Vilsack. "We understand that these improved meal standards may present challenges for some school districts, but the new law provides important new resources, technical assistance and flexibility to help schools raise the bar for our kids." According to government data, almost 32 percent of children 6 to 19 years of age are overweight or obese; the number of obese children in this age range has trebled in the last few decades. These children are more likely to have risk factors associated with chronic diseases such as high blood pressure, high cholesterol, and Type 2 diabetes. America’s school-aged children will have twice the amounts of fruits and vegetables on their school lunch trays, as well as more whole grains, and less sodium and trans fat, under the new nutrition standards for school meals unveiled by the U.S. Department of Agriculture. Despite heavy lobbying by the food industry and Congressional interference, the new standards are the best ever, according to the nonprofit Center for Science in the Public Interest. Approximately 32 million children eat school lunches and breakfasts, providing half of many children’s daily calories, according to USDA. The standards released yesterday were mandated by Congress in the Healthy, Hunger-Free Kids Act, signed into law by President Obama in late 2010. "This isn’t just about our kids’ health. Studies have shown that our kids’ eating habits can actually affect their academic performance as well," First Lady Michelle Obama said at a ceremony at Parklawn Elementary School in Alexandria, Va., where the new standards were released. "Anyone who works with kids knows that they need something other than chips and soda in their stomachs if they're going to focus on math and science, right? Kids can’t be expected to sit still and concentrate when they’re on a sugar high, or when they’re stuffed with salty, greasy food -- or when they’re hungry." In the next month or two, USDA will propose regulations setting nutrition standards for the rest of the foods sold in schools, including through vending machines, school stores, and the a la carte foods sold in the cafeteria alongside the USDA-reimbursed meal. Although health groups praise the new standards, food industry lobbyists got Congress to prevent USDA from limiting French fries and ensure that pizza counts as a serving of vegetables due to its tomato paste. “USDA, states, school officials, food manufacturers, food service workers, and parents need to work together to help all schools meet the new standards,” Wootan said. The rules set calorie maximums for the first time and lower calorie minimums to better ensure that school meals address obesity, as well as hunger. All milk sold in schools will have to be low-fat or fat-free. The Healthy, Hunger-Free Kids Act will provide schools with additional funding, training, model menus and recipes, healthy product specifications for commodities, and more frequent reviews to ensure that school systems comply with the new standards. This is the year Congress may take action to ensure schools offer healthier food to their students. Rep. Lynn Woolsey (D-CA) has introduced a bill that would get junk foods out of schools once and for all, a measure likely to be addressed when Congress reauthorizes the Child Nutrition Act, which expires this year. Current federal law prohibits only the sale of narrowly defined "foods of minimal nutritional value" in the cafeteria during meal times. But the nutrition standards for those foods haven't been updated in 30 years, during which time obesity rates in children have tripled. The Child Nutrition Promotion and School Lunch Protection Act would have the U.S. Department of Agriculture update the nutrition standards for foods sold alongside school meals in cafeterias, vending machines, school stores, and elsewhere. Those standards would apply throughout the school day, and everywhere on campus — important reforms in an era where "multi-purpose rooms" are replacing cafeterias and vending machines line hallways. While the typical school lunch is reasonably balanced, according to the Center for Science in the Public Interest (CSPI), children may replace it with, or add to it, sugary sports drinks, pizza, French fries, Snickers bars, Cheetos, or other nutritionally poor choices from a la carte, vending, and other sources. "Despite pockets of progress in some states and school systems, most schools make junk food readily available to children," said CSPI nutrition policy director Margo G. Wootan. "But junk food in schools helps fuel an epidemic of obesity and diabetes in children. And, it undercuts the considerable federal investment we make in the healthy school lunch program." Current nutrition standards keep some junk food out of the schools but let other junk food in through the back door. Today, doughnuts are allowed but lollipops are not. Cookies are fine, but breath mints are banned. "It undermines the federal nutrition standards for meals if students spend their money on unhealthy options, said Woolsey. "It also undermines the role of parents who give lunch money to their children expecting them to eat something wholesome and nutritious and their money is spent on unhealthy options instead. That s why I introduced this legislation, and I look forward to working with my colleagues to get it signed into law." USDA's definition of foods of minimal nutritional value hasn't changed since 1979. The Carter Administration's definition was focused on making sure foods sold in schools had five percent or more of the recommended daily intake levels of protein, vitamin C, calcium, and other nutrients. However, that definition included no maximum amounts for calories, saturated fat, or sodium — all of which children now consume too much of. As a result, innocuous products like seltzer water or breath mints are forbidden, while ice cream bars and doughnuts are perfectly acceptable. "Look, you can see how officials 30 years ago might have been concerned about whether our children were getting enough riboflavin or niacin," Wootan said. "Today, we need to reorient food policies toward preventing obesity, diabetes, and other diet-related diseases that might result in this generation of children living shorter lives than their parents." "Many of the foods being sold to our students on school grounds undermine federal investment in healthy school meals, nutrition education, and the lifelong lessons that parents teach their children about healthy eating habits," said National PTA President Jan Harp Domene. "Families and local leaders have successfully advocated to remove unhealthy alternatives from some schools, but it is time for national leadership on this issue." Besides CSPI and the National PTA, the legislation is backed by a coalition of medical, health, and children s advocacy groups including the American Dental Association, American Diabetes Association, American Dietetic Association, American Heart Association, Partnership for Prevention, Save the Children, and School Nutrition Association. The bill has 88 cosponsors. Eating food from a vending machine on a regular basis may put children on a path to obesity, diabetes and coronary artery disease, according to researchers at the University of Michigan Medical School. "The foods that children are exposed to early on in life influence the pattern for their eating habits as adults," said lead study author Madhuri Kakarala, M.D., Ph.D., clinical lecturer of internal medicine at the U-M Medical School. Previous studies assessing the nutritional value of school lunches and the impact they have on children's overall health have found similar results, but this study is the first to look specifically at competitive foods and beverages -- those sold at snack bars or vending machines, rather than through the USDA lunch program. At the same time, the USDA lunch program may have problems of its own. A USDA study released last month found that children who eat school lunches that are part of the federal government's National School Lunch Program are more likely to become overweight. In the U-M study, researchers analyzed data from 2,309 children in grades one through 12 from schools across the country. Interviewers administered questionnaires to obtain 24-hour food intake data on a given school day. Second-day food intake data was obtained from a group of students to account for day-to-day usual intakes. Among those surveyed, 22 percent of school children consumed competitive or vended food items in a school day. Usage was highest in high school, where 88 percent of schools had vending machines, versus 52 percent of middle schools and 16 percent of elementary schools. Competitive food and beverage consumers had significantly higher sugar intakes and lower dietary fiber, vitamin B levels and iron intakes than non-consumers. "Consumption of vended foods and beverages currently offered in U.S. schools is detrimental to children's diet quality," Kakarala said. "Childhood obesity, resulting from poor dietary choices, such as those found in this study, greatly increases the risk for many chronic diseases. A healthy school food environment can reduce these dietary risks." Based on their findings, the study authors recommend school administrators design guidelines restricting vended and competitive foods and beverages to those that are rich with nutrients and not energy-dense. Additionally, school food service personnel can prepare point-of-service materials and displays to promote more healthful foods such as fresh fruit, yogurt, low-fat milk, juice and sandwiches. "Targeted nutrition education to promote the importance of healthful snacks is further stressed by the Child Nutrition Act -- the major federal legislation that determines school food policy and resources," Kakarala said. "These and other types of school-enforced policies can be very helpful for children in making smarter eating choices throughout the school day."